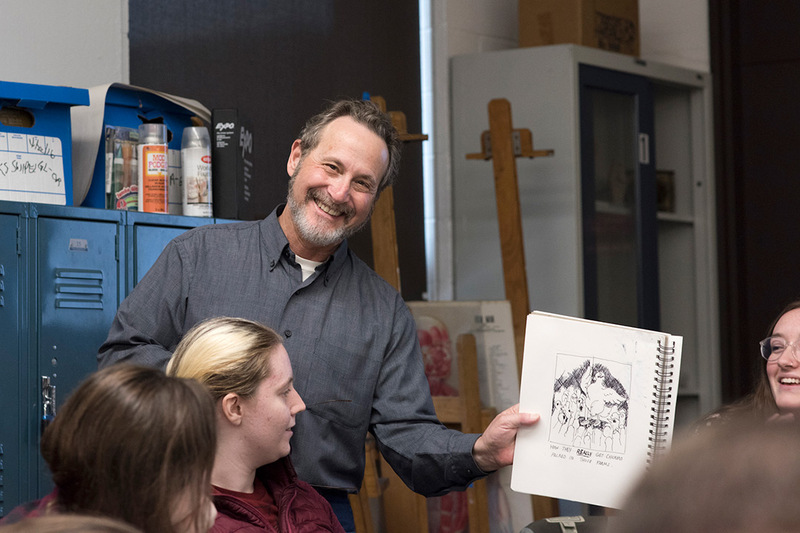 Leigh Rubin, cartoonist-in-residence at RIT this week, talks with Megan Banks, a fourth-year medical illustration student from Youngstown, Ohio, about ways to be creative and express concepts. 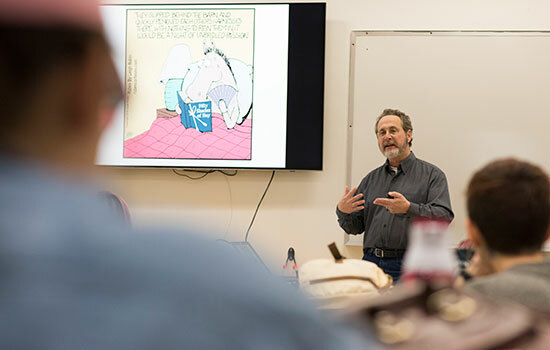 Students at Rochester Institute of Technology this week are learning first-hand what it’s like to be a syndicated cartoonist, with Leigh Rubin, the creator of Rubes, as cartoonist-in-residence. Rubes is published in Rochester’s Democrat and Chronicle and more than 400 media outlets around the world. Rubin began his cartooning career in 1978 when he established his own greeting card company, Rubes Publications. The company has also sold his cartoons on merchandise including mugs and calendars. In a medical illustration class Monday, Rubin asked students to think about linking two seemingly unrelated items together, such as “strippers” and “chicken.” He walked around to see what the students had come up with. He told them sometimes creative ideas need time to simmer, so he puts half-completed sketches away to revisit another time. “You work around with it until you get something. Sometimes it works, sometimes it doesn’t,” he said. Rubin, whose visit is sponsored by RIT’s College of Liberal Arts, College of Art and Design, School of Individualized Study, the Office of the Provost and Senior Vice President for Academic Affairs, expects to speak with students in art history classes, video game production and design classes. He’ll also talk to students about the business aspects of his work to help them better understand what it’s like to be a successful cartoonist, including branding and working with publishers and syndications. He also plans to meet with faculty across the university to discuss best practices for teaching students how to be more creative and innovative, two hallmarks of an RIT education. His visit will coincide with the east coast premiere of Drawing Inspiration, the pilot of a proposed television travel/documentary/reality program with co-creator Ryan Johnson. The free showing, presented by RIT and the Rochester Democrat and Chronicle, will be 6:30 p.m. Wednesday in RIT’s Webb Auditorium. Reservations are suggested. Rubin plans to return to RIT in the spring to continue working with students and faculty on various projects.